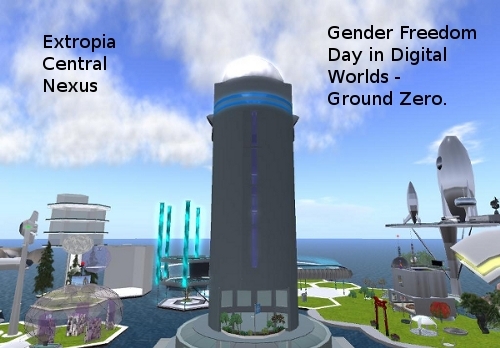 “Gender Freedom Day in Digital Worlds” – hooray for diversity! You are here: Home / Virtual Worlds / General News / “Gender Freedom Day in Digital Worlds” – hooray for diversity! Gender Freedom Day is the brainchild of Sophrosyne Stenvaag, a digital individual who inhabits digital environments such as Second Life. Stenvaag envisions the Day as a promotion of “freedom of expression of gender identity and sexual preference in digital worlds” – a celebration of all choices of gender identity and sexual preference, and the ability of all the individuals to interact in a civil and respectful manner. 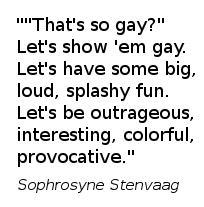 Stenvaag is disappointed and horrified by the cultures in digital environments – the hatred of, hate crimes surrounding, and general uncivil and unnecessary expression of biases surrounding gender and sexuality difference of expression. The hub of the Day’s activity will be at Extropia, Stenvaag’s paradise of difference in self-expression in Second Life. However, Stenvaag hopes to spread the word of the day far and wide, and to have events engaged in throughout Second Life predominantly. Individuals from other digital environments, and even those in the atomic world, for those who have the resources to do so, are welcome to join in with the fun and festivities. As of a couple of days ago, event organisation was in full swing, with several speakers with academic backgrounds giving their commitments to makes presentations, DJs having been approached to provide entertainment throughout the fundraising party (running 2pm to 10pm SLT on the Day), and discussions with a welter of other communities and organisations progressing apace. Individuals wanting to inject their own brand of creativity, make a presentation, or generally volunteer to help out are most welcome to do so: you will want to liaise with Sophrosyne Stenvaag in Second Life. The fundraiser will be collecting money on behalf of organisations who promote the ideals of the Day. The exact organisations will be determined before the money is dispensed. Stenvaag is currently open to nominations for existing organisations and start-ups who could benefit from the money. Stenvaag herself is starting the kitty at L$125,000. In a digital setting, this kind of attack via speech, in which individuals are treated as though their expression of self is invalid, in which individuals are treated as objects or “things”, and other such attacks upon the self, is more heinous than any other kind. In the atomic world, far worse things can happen to you, of course, but for those of us who live in a digital world, we have a responsibility “to not sit silent and permit a culture of hatred to flourish” in our homes. There are other reasons for holding a Day like this in a digital world, too. Because the denizens of digital worlds represent a subset of the individuals represented in the atomic world. Not only does that mean that there is a smaller sample of people amongst which to spread the word, but also that folks from digital places can take the word back with them to the atomic world and make a difference there too. Fewer resources are required, compared with similar efforts in the atomic world. One side effect of this is that more money can be donated to the organizations, instead of being spent only on the celebration. A more diverse lot of people are recognised and represented. Not only are the common (gay, lesbian, transgender, etc) expressions of gender and sexuality able to be represented, but also those that have emerged through the existence of digital environments. Thank you for a terrific feature! If anyone's interested in offering support, either within Second Life or in other digital worlds, please feel free to contact me by notecard in SL or through a comment to my blog, cited above. I do want to clarify, though, that the community of Extropia is “mine” only in the sense that I live there and serve on its Board of Directors: the community belongs to its residents and supporters, currently numbering around 400, all of whom make it a stylish, futuristic, and safe place to live, work and explore!